After the winter months dragged by, I feel like the speed of time has tripled in April. There are less than two weeks remaining, and I feel like I'm not even close to doing everything I planned to do. I know that life is more than checking things off a list, but for me those lists are what keep me motivated and keep me organized. Part of what has made this month feel so frenzied is all the GOING. My homebody tendencies strengthen with age, and the combination of events, showers, and family visits (all good things, mind you) that have filled up April's calendar have worn me out. This outfit has been a perfect one for a busy month. The combination of pull-on skirt, tee shirt, and light outer layer (in this case, chambray...big surprise) is one that I reach for again and again when I have to go quickly from one thing to the next. In this case, I went from a busy day at work to a long car ride to visit my in-laws. It has just the balance of comfort and polish that I need. Are you a homebody like me or is a full social calendar more your jam? Linking to Mix it Mondays, Inspiration Monday, Mingle Monday, and Let it Shine. 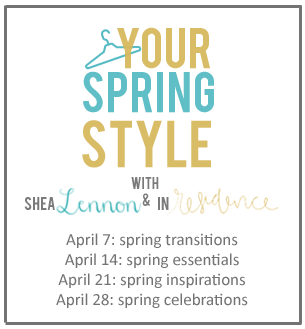 Come back tomorrow for Your Spring Style and link up your "Spring Inspirations" looks. I'd love to see what's inspiring you right now and how you're interpreting that inspiration in your own closet. 5 years ago: wearing shades of gray with a pop of turquoise. 4 years ago: making flourless chocolate cake (with a kick). 3 years ago: pairing a still-favorite dress with some bright plaid. I love it! The floral skirt is really cute! I'm definitely more of a homebody and my calendar has been almost too full lately too! It's been for good things too but I need a break! 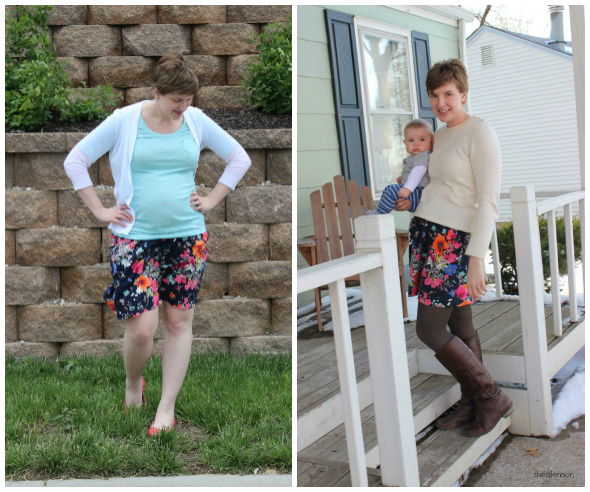 Love your floral skirt! I was about ready to comment on the cute yellow shoes with the skirt, and then my eyes skipped right to that flourless chocolate cake with cayenne pepper from four years ago. I like to think I'm a homebody, but then again, I feel like I am never home! Life is crazy!! I do love this skirt on you. I have a similar one that I need to pull out of hiding! I hear you! I'm so behind on blog reading, post writing, etc.--I need a day just to catch up on blog stuff not to mention house/cleaning stuff too..Sigh :) Thanks Beth! Thank you! You should pull it out of hiding :) Life IS crazy and that's how I've felt this month--I'm never there! But it's definitely good to have a balance of both going out and staying in (I'm just doing ALL the going out this month it seems). Cool printed skirt and sandals! I would totally wear this outfit! I love the layering and the blue on blue, and the pop of bright color in the shoes is perfect! Thanks Jess--I love it too, the colors in it go with everything springy it seems. That sounds really nice! It can be fun to be busy doing lots of fun things, but I'm equally excited about a stretch of time where there's nothing on the calendar too! it absolutely works for so many events! i am introverted and i have social anxiety, so i'm a homebody usually, but have really made strides in going and doing things laone!